Unsure which engine size to choose for your new or pre-owned truck? 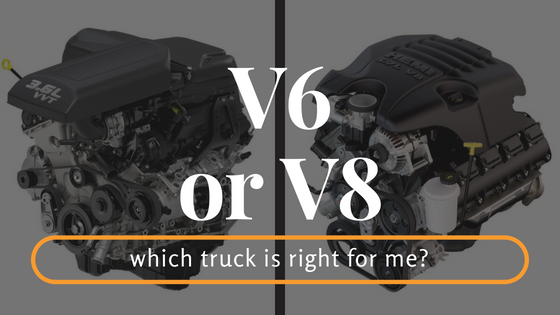 When buying a truck, the question of a V6 vs a V8 is common. the number of cylinders to consider when buying a truck. Choosing between an V6 and a V8 is not as cut and dry as it used to be. at more than just the number of cylinders. What’s the difference between a V6 and a V8? while a V-8, you guessed it, contains 8.
while a V-8 will give you more power and performance. More power, better fuel economy. truck you’re considering doesn’t offer a turbocharged or diesel engine option. What Truck is configured for MAX payload and MAX towing capacity? 5.7-Liter V8 HEMI® MDS VVT 4×4 quad cab, 140.5 wheelbase, 3.92 axle ratio Tradesman. Will you be using the truck to tow anything? How important is fuel economy to you? Horsepower? RAM trucks offer many engine performance options. It’s really about finding the truck that fits your needs. 0 comment(s) so far on Which Truck is Right for Me? A V6 or V8?